Lautus Digital RCA is the digital alternative to the Lautus RCA delivering an excellent digital connection through reduction of RF interference. 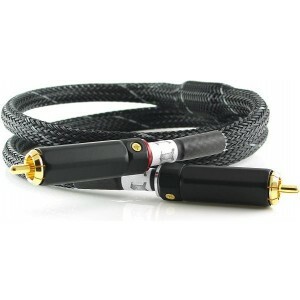 Graham Slee Lautus RCA digital cable is designed to deliver an excellent digital connection, thanks to strategically placed Ferrites to reduce the effects of RF interference and deliver a much better connection. The 75 Ohm characteristic impedance of the Lautus makes it highly desirable as a digital connection cable. It's the ideal S/PDIF interconnect because sending and receiving circuits use 75 Ohm impedances. It's also suitable for 5MHz video over short domestic distances. The Lautus Digital interconnect can be supplied with high quality nickel plated BNC adaptors should the equipment require them. The gold plating on the Lautus ensures a corrosion-free connection even with dissimilar metals and the Lautus phono plug clamps make a tight fit with the BNC adaptors.